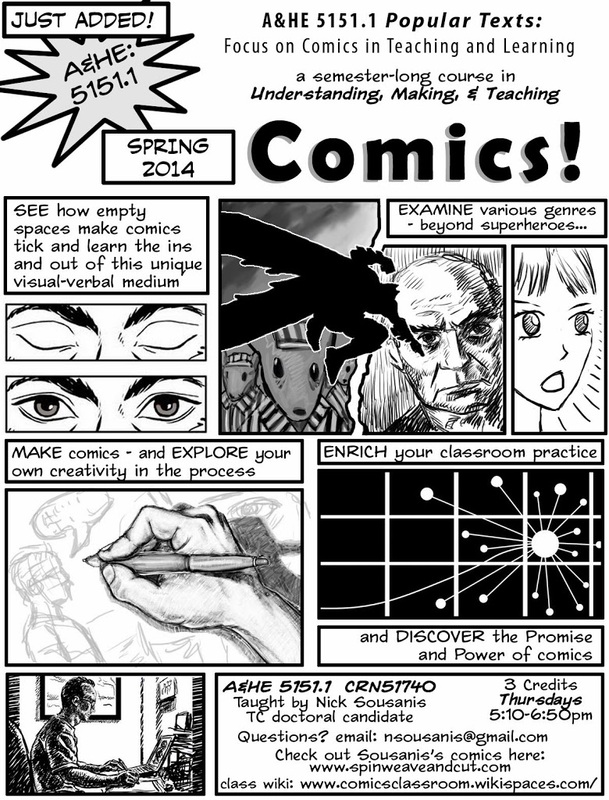 I’m pleased to report that this spring I’ll be teaching my comics for educators course once again, at Teachers College, Columbia U. This will be the fourth time we’ve offered this course, and each one has been a rewarding experience and I’m eager to connect with the next group of students. We talk theory, explore a range of titles, authors, and genres, all while doing a lot of hands-on making. Ultimately my students create plans for what they’ll do using comics (and visual thinking more broadly) with their students in their own classrooms and other educational contexts. I find it rather amazing to have begun my own post-highschool education at a time when doing comics was definitely not something one did in school, and to now be working with teachers to integrate comics into their classrooms (and then there’s the matter of dissertation as well). It’s a sea change and exciting times! For more info about the class, please see the wiki I maintain, which is full of resources around comics and education. 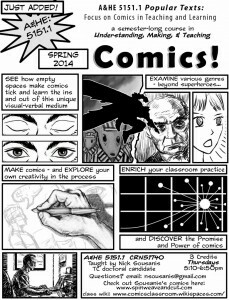 While it was made to serve the class, I’ve made the resources available for anyone out there interested in similarly incorporating comics into education. Check it out! Also, next monday, November 25, I’ll be presenting on my dissertation at the 68th meeting of the NY Comics and Picture-Stories Symposium. This weekly meet up was set in motion by legendary New York cartoonist Ben Katchor, and i was fortunate to attend the first session and ended up presenting the next meeting. As a comics-maker in academia – I end up talking comics to a lot of folks for whom comics are a new thing, so attending this symposium frequently over the last year and a half has been a wonderful opportunity to expand my cohort and get to know and learn from a wide range of established and emerging cartoonists/artists/scholars. Brooklyn cartoonist Brendan Leach will be speaking the first hour about his new book “Iron Bound” from Secret Acres press (which includes a super-cool flexi-disk audio soundtrack to accompany his gritty tale of Jersey street gangs in the early 60s). 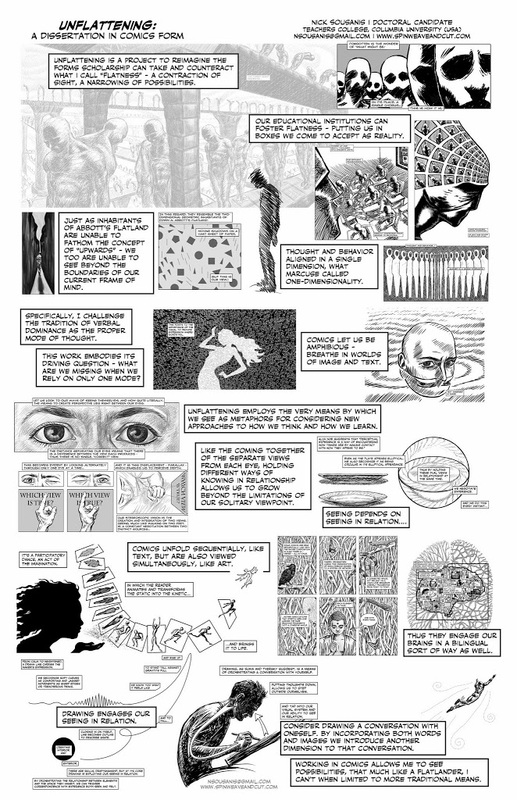 I’ll be sharing images and talking ideas on comics and perception as a way of thinking from my dissertation. For a little overview of some of this, I recently made a poster for a conference out of clips from the dissertation accompanied by additional narration. Please note, this poster is not my dissertation – it’s simply a poster! 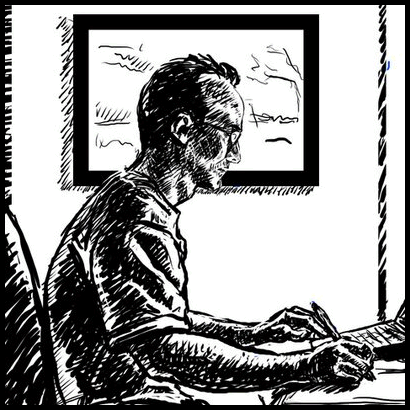 If you want to see the comics pages from the dissertation itself – please click the “dissertation” tab/label at the upper right.